The ethereal centre of innovation project, unveiled in Hungary, stands for the mutual inspiration of science, technology and art. A twenty four meter passage surrounded by the reflections of reflections. 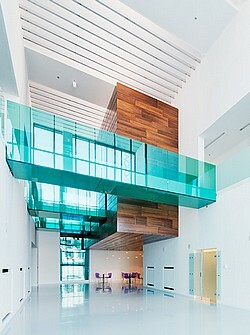 Foldes Architects involved a glass sculptor to compose the illusion effects engaging the visual notion of all visitors. Despite the economic challenges of the last years, the contact lens industry remained remarkably prosperous. A leading producer of contact lens and aftercare solutions, Sauflon, decided to establish a part of their lens production in Hungary. A decision, which was followed by the foundation of a subsidiary company in 2005. The opening of the Hungarian production facility ensured a 35% yearly growth, therefore in March 2012 the British parent company decided to create a centre of innovation in Hungary to present the latest technologies in the form of a first class business and clinical training series of inspiring spaces. Five local architectural studios had been invited to tender for the project, which was eventually won by the renowned Foldes Architects. Laszlo Foldes, chief designer of Foldes Architects, explained the concept that lay behind his company's presentation. ‘The task was to create an iconic yet functional centre of innovation which mainly serves as the showcase for the high-tech, innovative production methods used in the manufacturing of the latest generation, high-quality contact lens products of Sauflon. 700 people in 4 shifts work daily at the factory which shares the space with the centre of innovation. Though lens production can’t be compared to average factory operation it still meant the industrial to us. It challenged our minds how to couple it to a pure, event and conference oriented, guest welcoming, elegant space. The concept derived from the definition of lens, the means of vision, and also we took inspiration from the high-technology of the lens industry, therefore clean, intelligent, integrated solutions as well as playful reflections, gloss surfaces and transparency played great importance during the design. This concept is supported by the resin flooring, the glass bridges, the opened-up volume and the tremendous flow of light streaming through the glass façade and the glass roof.’ He said. Laszlo Moholy-Nagy, Hungarian origin artist of the 20th century drew the attention of the public to the importance and meanings of vision through his art works, theories and books, among which the Vision in Motion, speaking about the ‘man's fundamental qualities, of his intellectual and emotional requirements, of his psychological well-being and his physical health.’ All of these facets of the human experience were used in this exciting new project.